“Grizzly Steppe”: Is This a Joke? The Obama administration is retaliating against Russia for hacking into Debbie Wasserman-Schultz’s email account. It would have been much better if the administration had reacted when Russia hacked into the White House’s and State Department’s computers in 2014, but, as Glenn Reynolds says, at that time only national security was at stake, while now, it’s something really important: the Democratic Party’s power. The U.S. on Thursday released its most detailed report yet on Russia’s efforts to interfere in the U.S. presidential election by hacking American political sites and email accounts. The 13-page joint analysis by the Homeland Security Department and the Federal Bureau of Investigation was the first such report ever to attribute malicious cyber activity to a particular country or actors. It was also the first time the U.S. has officially and specifically tied intrusions into the Democratic National Committee to hackers with the Russian civilian and military intelligence services, the FSB and GRU, expanding on an Oct. 7 accusation by the Obama administration. So the report is really important. I read it yesterday, and had to triple-check to verify that this is the document the administration has been hyping. A commitment to good cybersecurity and best practices is critical to protecting networks and systems. Here are some questions you may want to ask your organization to help prevent and mitigate against attacks. The U.S. Government confirms that two different [Russian civilian and military intelligence Services] actors participated in the intrusion into a U.S. political party. The first actor group, known as Advanced Persistent Threat (APT) 29, entered into the party’s systems in summer 2015, while the second, known as APT28, entered in spring 2016. The “U.S political party” is of course the Democratic National Committee. But what is the evidence that the Russian government was behind the hack? In summer 2015, an APT29 spearphishing campaign directed emails containing a malicious link to over 1,000 recipients, including multiple U.S. Government victims. APT29 used legitimate domains, to include domains associated with U.S. organizations and educational institutions, to host malware and send spearphishing emails. In the course of that campaign, APT29 successfully compromised a U.S. political party. At least one targeted individual activated links to malware hosted on operational infrastructure of opened attachments containing malware. APT29 delivered malware to the political party’s systems, established persistence, escalated privileges, enumerated active directory accounts, and exfiltrated email from several accounts through encrypted connections back through operational infrastructure. IOCs associated with RIS cyber actors are provided within the accompanying .csv and .stix files of JAR-16-20296. I am not competent to interpret this information. No doubt some of our readers will weigh in, in the comments. But really: is this the best evidence the administration has that the Russian government hacked Debbie W-S’s email account? It seems remarkably feeble. The administration’s claim may be true. I have no idea whether it is or not. But the thinness of any persuasive evidence in a 13-page report that consists mostly of boilerplate advice to IT personnel inspires very little confidence. Regarding “Grizzly Steppe”. Has there ever been an administration that over-promised & under-delivered more than Obama’s?!? It’s comical how poorly this man’s team consistently has scored on “real world” metrics for 8 years. “Debbie Does Dulles” as in Allen Dulles. Does anyone else get the idea that the O Admininstration is trying to kick up as much trouble as possible for the incoming T Administration ? YES, NOT ? Answer YES. I would be interested in who almost caused this big rift between the US and Russia; Who’s laptop had the code; where did they get it; why was it on the laptop ? Compare this last minute excitement / punnishment to that that occurred when National Security was at risk. O Admin has egg on their faces again – not nearly the wizards they claim to be. Difficult for them to accept defeat gracefully and in a responsible manner. You forgot to report the part where the administration apoplogized for the behaviors and dishonesty revealed. Page 14? This report does not say why no RNC sites were compromised or what other, if any, government actors were compromised. Was the DNC the only fool to be compromised by the broadly sweeping phishing? Does Wikileaks have different information than these Russian exfiltrations or was Russia just hosting Wikileaks? Ok, now I got . . . I can keep my doctor, it was the video in Benghazi and the Russians did it. How much more clarity could one want? I don’t think Hillary wanted to win. She choked a week before and proof of that is she cancelled the firecrackers. Furthermore, she booked the glass convention centre that Trump built years before for her finale. Subconsciously that was the glass ceiling she couldn’t break because Trump built it. The Russians have mind-hacked Obama to perform as ridiculous an exit as possible. Motive: contempt. The anti-Trump coalition continues to do Putin’s bidding. What is the real import of this molehill? The more our Country can be divided the less effective we will be in putting America first. This coincides with the plutocracy’s goal of destroying America as a nation state. The coalition wants to conflate hacking the DNC’s emails with hacking our election process. There’s no concrete proof of the former and consequently no proof whatsoever of the latter. The coalition wants to hamstring our President-elect to block him achieving the goals he was elected for. A secondary objective is to keep anyone from looking into the voter fraud committed by the dems. Scary, but the clown is supposedly a lawyer. There’s no doubt in my mind that he’s a lawyer. Perhaps the sorriest part of this pathetic Administration is how they have completely destroyed all credibility of our intelligence agencies. Who cares what the CIA, DHS, FBI, NSA et al say about this? Obama has subverted them all and they are relegated to political hack status. Trump will have to burn down the agencies and rebuild. In the meantime, everything they say is highly suspect. Sad. Yep, this is pretty grisly. Maybe Trump and Putin can make an announcement from the Trump Tower in NYC that Russia is forming a joint task force charged with releasing all hacked documents; ask all world hacker’s and WikiLeaks to come forward with any illegally obtained information. The information will be made publicly available to the American people so that they may judge for themselves why the Obama Administration almost got us into a war with Russia. Jeff Sessions will then step up to the podium and announce that if USG Classified documents are found, prosecutions by the USG will be levied against those who initially mishandled them. Any other violations of US law brought to light will also result in criminal prosecution. President Trump can then come out and announce both the Russian Federation and liked minded Western Nations are going to create a new diplomatic organization that will take the place of the UN. This would just about clean out the DNC with no push back from the public. It would destroy an Obama UN Secretary General appointment, and Fauxhontas. It would pave the way diplomatically for the West and Russia to move forward in a new spirit of peace and cooperation. You know someone in the Obama Administration is BS’ing when he tells the stenographers in the media that 17 intelligence agencies agree that the DNC hackers were Russian Government agents. The reason that we have 17 different intelligence agencies is that each specializes–none does everything. All any statement about 17 intelligence agencies means is that Coast Guard Intelligence and the rest have no objection to blaming the Russians. What does the Drug Enforcement Agency have to say about hacking? What about the Department of Energy, which is responsible for evaluating intelligence on nuclear weapons? Does the National Geospatial Intelligence Agency have a satellite photo of the hackers? Even the only agency that can speak for the entire US intelligence appartus, the Office of the Director of National Intelligence, only runs the committee meetings–it has no means of analyzing evidence of a computer hack. I think the Obama Administration codified it into operation law as objectively legal. Imagine taking down BLM, Greenpeace, the Clinton & Obama Foundations, and Georgie S with the IRS. Kinda like Harry Reid’s Nuclear Option – some things get better with age. Talk about a con job…. Csv is the old ASCII, comma/tab/space, etc. delimited file format. Actors, actors, actors. If this is genuine Foreign Intrigue, where are the actresses? They’re all called “actors” now. Anyone want to chip in to get Duffort some buttcream? He seems to be really hurting. Maybe one of those blow up cushions with a big hole in the middle. I love the smell of dems going nuts any time of the day. obama was aware of the ongoing cyber attacks back when he was elected. But he only got around to addressing the problem in the last three weeks of his reign of terror. There is absolutely nothing in the document that points to the Russian State as perpetrators. On the contrary, the only “evidence” points to techniques used by any unsophisticated hacker. I will contend the DNC was never hacked but rather leaked by an insider. Podesta was hacked but not by a state actor. Clinton’s secret server was no doubt hacked by State actors according to the FBI but nobody getting excited about that. Guccifer claimed HIllary’s server was a piece of cake and that he saw evidence of others had been there. The “root kit” fragment shown in your post indicates absolutely nothing. It is typical of thousands of that type of infiltration and could have come from anywhere in the world. If they did not provide firm evidence this originated from Russia, it is a half-baked attempt to cast blame and fails miserably. I guarantee you it was thrown together under orders and with abysmal knowledge level of most journalists and their editors, it is a fraud. You don’t need “root kit” to phish for passwords , it is something done all the time by various people for many reasons (nearly always in a quest for ill-gotten gain). Number one: never ever respond to any email claiming some kind of account problem requiring an immediate “password” change or reset. A “helpful” screen will often be provided to help and it may look very legitimate. No credible organization will use this approach. More bread and circus from the Obama people. What judge at the Federal level would allow this rubbish as evidence? AS we have seen in the past, there are a myriad of Federal judges willing to help in the attack on the right. All that snippit is proof us is that you can’t fix stupid. You would think that if they were going to invent some code to “prove” something, they would bother to make it pass programming 101. I am competent to evaluate such things, unfortunately there is not enough information to evaluate properly and what information is provided is, as you mentioned, generic security advice. Lastly, if these “hacks” (they’re not really hacks or cracks, just phishes) were properly done, there would be absolutely no known point of origin or useful path available to blame on anyone. For them to conclude “it’s the Russians” without any correborating information through other channels is ludicrous. The “report” mentioned no such correboration. No, we are retaliating against Russia for using material stolen from a major domestic political party to influence a US election. It arguably is an act of war. So to make sure I understand this right, stealing private emails from those with political influence or information or thinking of some sort, in order to better insure a political outcome of one’s liking, is something that can be considered legitimate grounds for armed violence? Not arguing against, just want to make sure we get universally applicable ground rules established. Was it an act of war when the US attempted to influence Israel’s 2015 election? Or any of the other 117 elections the US has influenced around the world from 1946 to 2000? Consider, this is the same administration of rogue agents and if you like your doctor, you can……. It’s cases like this that rely on past credibility. In this instance there is none. Who, at this point, would believe one word said by this administration? There has never been a more thoroughly discredited and documented nest of liars. They lie as a matter of strategy. When caught out on open mics or other fora, they admit this. I’m not sure I can draw the conclusion that pulling emails off of a political party’s server is equal to hacking a government server. At least as far as resulting in significant government retaliation. It seems asymmetrical. Why not? They did nothng when they said the Russians hacked the White House and shut down their systems for a few weeks. What if a high level US politician gets drunk and passes out on a park bench…while passed out a folder with some secret information falls onto the walkway… someone picks up this information and discovers it is highly prized strategic concerns from a super power and they keep it. This would be the equivalent to what happened to Hillary… dunno about the rest of the DNC. There is a giant leap of logic based on what the FBI & DHS are claiming is “evidence.” There was spearphishing, which is done by Russian government and non-government actors…and Nigerian royalty trying to hide their ill-gotten gains in my bank account and snot-nosed American, European, NorK, Venezuelan, etc. hackers. Oh, but they used malware that Russians sometimes use, which is also used by Nigerian royalty and snot-nosed American, European, NorK, Venezuelan, etc…. Once malware is used, any competent hacker can modify it for their own personal use. They used a fake domain, just like the Russians…and Nigerian royalty and snot-nosed American, European, NorK, Venezuelan, etc…. Whoever did the hack is probably smart enough to cover their tracks. So, unless there is some HUMINT out there telling us who it really was, the joint report really lends no credence to the story. Exactly why we need a Select Committee to investigate the facts, and lay them out in full to the public, as soon as possible. Paul Dueffert And we need this outgoing admin to stop politicizing it, right, Paul? We should wait for facts. Your comment only points pout how irresponsible Obama is being now and has been in the past. Russians are known to use screw drivers. The window was forced open with a screw driver. Obviously the Russians did it. Only Congress can figure it out. The last time they tried, none of the intelligence agencies showed up. A stern letter will follow. If the Russians did hack it still doesn’t explain the incentive to have Trump over Hillary. Yes, I know Trump was saying nice things about Putin but everyone already knows that the Dems are patsys and the Russians have hilLIARy’s emails and much more with which to blackmail her to get what they want. I have another thought. If the Russians were somehow involved with the leaks and assuming they have every reason for another feckless Dem admin, I think they were fooled by the polls and just wanted to weaken the presumptive winner when she becomes president. And for all their trouble, presuming that the Russian agents were behind this, they uncovered, what? The Democratic party’s strategies on how to win the public over into accepting the 48.37 sets of transgendered pronouns? If this is the case, then I almost feel sorry for the Russian agents who had to read this crap. I personally wouldn’t but then again, Putin isn’t my boss. Material that helped fuel a steady drumbeat that HRC had problems with emails. Paul Dueffert Well, she did. Correct. As Ronald Reagan knew all too well, the Russians were, and remain, our primary geopolitical threat. Sarcasm escapes you, I see. Paul Dueffert OK. So why did Obama wait 7 years and 49 weeks to do something about that strategic threat? He’s an idiot, you say.? OK. We finally agree on something. (i) Termination.—The Center shall terminate on the date that is 8 years after the date of the enactment of this Act. A new regional dynamism on peace and conflict led by Russia and China has emerged. With the presence of armed groups and the emergence of new terrorists bands such as Daesh there, Afghanistan remains at the of these new developments. The third session of a trilateral “working group” comprising Russia, China and Pakistan held on December 27 in Moscow also underscores what is playing out in the region. Following the rare meeting, the group announced that Kabul will be invited to participate in future meetings on the threat posed by Islamic State (IS) militants in Afghanistan. The decision appeared to be a response to Afghan Foreign Ministry spokesman Ahmad Shekib Mostaghani who, in a note of disapproval, had asserted that “regardless of the good intentions of the participants, the Moscow talks would not help the situation in Afghanistan.” In a joint statement the three nations also reiterated their interest in facilitating peace talks between Kabul and the Taliban. The most striking in the statement was the collective “particular concern” over “increased activities of extremist groups including the IS (Daesh) affiliates in the embattled country. Speaking during the quarterly review of the Afghan situation at the Security Council on December 19 Churkin said elimination of Taliban leader Mullah Mansoor only strengthened the influence of irreconcilable radicles which only compounds the current situation in the country. Keeping in view these aspects, one wonders whether the new regional group will eventually trump the Quadrilateral Contact Group comprising China-Pakistan-USA-Afghanistan that was created on the sidelines of the Heart of Asia conference at Islamabad on December 9, 2016? Or is the beginning of a new geo-political game between two obvious blocs (Indo-Afghan-USA and Moscow-Beijing-Pakistan-Iran) divided by conflicting views on sources of terrorism and shared interests in regional peace and development? Published in The Express Tribune, December 29th, 2016. By now, anyone in this country still of sound mind knows that Barack Obama presided through eight years of remarkable continuity – of changeless conditions that left a great many hopeless. As the days of his tenure dwindle, what do we make of the departing 44th president? He played the role with cool-headed decorum, but that raises the question: was he just playing a role? From the get-go, he made himself hostage to some of the most sinister puppeteers of the Deep State: Robert Rubin, Larry Summers, and Tim Geithner on the money side, and the Beltway Neocon war party infestation on the foreign affairs side. I’m convinced that the top dogs of both these gangs worked Obama over woodshed-style sometime after the 2008 election and told him to stick with the program, or else. On the money side, it was to float the banks and the whole groaning daisy chain of their dependents in shadow finance, real estate, and insurance, at all costs. Hence, the extension of Bush Two’s bailout policy with the trillion-dollar “shovel-ready” stimulus, the rescue of the car-makers, and a much greater and surreptitious multi-trillion dollar hand-off from the Federal Reserve to backstop the European banks with counter-party obligations to US banks. Another feature of life on the money-side of the Obama presidency was that nobody paid a personal price for financial misconduct. This established the basic ethos of Obama-era finance: anything goes, and nothing matters. All the regulators looked the other way most of the time. And when forced to act by egregious behavior, they made deals that let banking executives off-the-hook while their companies shelled out fines that amounted to the mere cost of doing business. It happened again and again. The poster boy for this kind of “policy” — or just plain racketeering — was Jon Corzine, the head of the commodities brokerage MF Global, whose company looted “segregated” customer accounts to the tune of nearly a billion dollars in the fall of 2011. Corzine was never prosecuted and remains at large to this day. Another signal failure in the money realm was Obama’s response to the 2010 Citizen United Supreme Court decision, which declared that the alleged legal “personhood” of corporations entitled them to exercise “free speech” by giving as much money as they wanted to political candidates for election. Big business no longer had to just rent congressmen and senators, they could buy them outright with cash. A conservative Supreme Court made the call, but Obama could have acted forcefully in the face of it. The former constitutional law professor-turned-politician could have marshaled a response in his Democratic Party-controlled congress to draft legislation, or a constitutional amendment, that would properly redefine the personhood of corporations. It should be obvious, for instance, that corporations, unlike human citizens, do not have duties, obligations, and responsibilities to the public interest; by legal charter they have only to answer to their shareholders and boards of directors. How does this confer the kind of political free speech “rights” that the court allowed them to claim? And how did the Obama and his allies in the legislative branch roll over to allow this disgraceful affront to the constitution to stand? And how is that almost nobody in the mainstream press or academic law even pressed these issues? Thanks to all of them, we’ve set up the primary means for establishing a fascist Deep State: the official marriage of corporate money and politics. Anything goes and nothing matters. Finally, in foreign affairs, there is Obama’s mystifying campaign against the Russian Federation. The US had an agreement with Russia after the fall of the Soviet Union that we would not expand NATO if they gave us a quantity of nuclear material that was in danger of falling into questionable hands in the disorder that followed the collapse. Russia complied. What did we do? We expanded NATO to include most of the former eastern European countries (except the remnants of Yugoslavia), and then under Obama, NATO began holding war games on Russia’s border. For what reason? The fictitious notion that Russia wanted to “take back” these nations — as if they needed to adopt a host of dependents that had only recently bankrupted the Soviet state. Any reasonable analysis would call these war games naked aggression by the West. Then there was the 2014 US State Department-sponsored coup against Ukraine’s elected government and the ousting of President Viktor Yanukovych. Why? Because his government wanted to join the Russian-led Eurasian Customs Union instead of an association with European Union. We didn’t like that and we decided to oppose it by subverting the Ukrainian government. In the violence and disorder that ensued, Russia took back the Crimea — which had been gifted to the former Ukraine Soviet Socialist Republic (a province of Soviet Russia) one drunken night by the Ukraine-born Soviet leader Nikita Khrushchev. What did we expect after turning Ukraine into another failed state? The Crimean peninsula had been part of Russia for longer than the US had been a country. Its only warm water naval ports were located there. They held a referendum and the Crimean people voted overwhelmingly to return to Russia. So, President Obama decided to punish Russia with economic sanctions. Then there was Syria, a battleground between the different branches of Islam, their sponsors (Iran and Saudi Arabia), and their proxies, (Hezbollah and the various Salafist jihad armies). The US “solution” was to sponsor the downfall of the legitimate Syrian government under Bashar al-Assad. We apparently still favored foreign relations based on creating failed states — after our experience in Iraq, Somalia, Libya, and Ukraine. President Obama completely muffed his initial attempt at intervention — the “line-in-the-sand” moment — and then decided to send arms and money to the various Salafist jihadi groups fighting Assad, claiming that our bad guys were “moderates.” Meanwhile, Russia stepped in to prop up Assad’s government, apparently based on the idea that the Middle East didn’t need yet another failed state. We castigated Russia for that. The idiotic behavior of the US toward Russia in these matters led to the most dangerous state of relations between the two since the heart of the Cold War. It culminated in the ridiculous campaign this fall to blame Russia for the defeat of Hillary Clinton. And here we are. I didn’t vote for Hillary or Donald Trump (I wrote-in David Stockman). I’m not happy to see Donald Trump become president. But I’ve had enough of Mr. Obama. He put up a good front. He seemed congenial and intelligent. But in the end, he appears to be a kind of stooge for the darker forces in America’s overgrown bureaucratic Deep State racketeering operation. Washington truly is a swamp that needs to be drained. Barack Obama was not one of the alligators in it, but he was some kind of bird with elegant plumage that sang a song of greeting at every sunrise to the reptiles who stirred in the mud. And now he is flying away. “I think this eight-year office served under the slogan of their exclusiveness evoked aversion of the entire world. 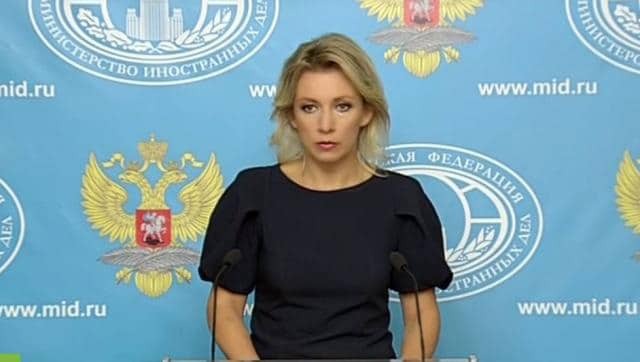 They have failed to fulfill their obligations taken before some countries, they have failed to fulfill what they were commissioned to, including by the American people on the global arena,” Zakharova said. “This is what this administration will leave in history,” she added.